Last Friday, I spent my whole day in my tasting room. This room is usually cool, but here it was so hot that after having tasted a large number of Darjeeling 2nd flush, I felt like having a cold tea. I prepared myself two different teas, because I like making comparisons: a Thé des Songes and a Thé des Sables. The recipe of iced tea is extremely simple: put 15 grams of tea in one litre of water, let it brew for 30 minutes, then filter the tea with the help of a tea strainer or a filter and it’s ready! After that, up to you to leave the carafe or the bottle in the fridge, if you want an iced tea rather than a cold tea. When serving, and as a suggestion of garniture, a few ice cubes with summer fruits taken in the ice (blueberries, raspberries, redcurrants): it’s nice and delicious. P.S. : on the picture, just behind the carafe full of Thé des Songes, one of the tea trees I received when I was in Japan last April. I take great care of it and it returns it good: it has already doubled in size! Great post! Iced tea, brewed from the leaves or flowers of numerous herbal plants, can provide you with a chilled glass of refreshing fluids. Not only can it help quench your thirst, but iced tea may also offer you several potential health benefits. Because everyone’s dietary needs are different, talk to your doctor before making any major changes to your dietary practices, including the use of tea as a self-treatment for a potential health problem. The summer is upon us in France, and with it comes the heat. 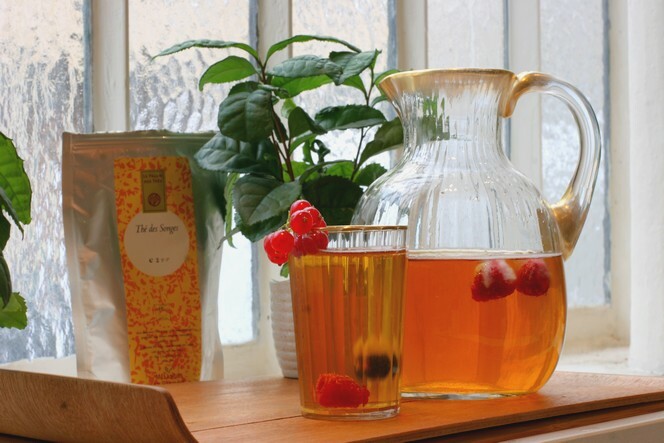 Many people like iced tea at this time of year, simply because they want a refreshing drink….